I can’t believe I’m about to say this, but not everything needs to be covered in chocolate. Not Just Cereal is a fine example. 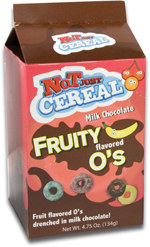 Chocolate coated cereal sounds like a great idea, but it’s overkill. One of my roommates liked the cereals, but roommate two and I were not fans. I think it must just be up to individual tastes. Don’t get me wrong, it wasn’t bad, just nothing special. My roommates and I did find ourselves munching on it when nothing else was available, though, so that might count for something. I suppose it’s alright, but it would be an unlikely purchase for me to make at a store. The first one we tried was Fruity O’s. Think Fruit Loops covered in chocolate. I was apprehensive about this one especially because it just sounded like a gross combination. It wasn’t half bad and I liked it a bit better than the others. I guess my biggest complaint is the chocolate isn’t the best. It’s similar to the chocolate on Whoppers, but not as good. After my stint with the artisan Wiseman House Chocolate products, I thought it would be nice to distance myself from the upper echelon/expensive side of Texas confection and return to the classic stuff I can find in my local drug stores. By the checkout register of Walgreens, I spotted an assortment of Texan candies that are from all over the state. There were fudges, brittles, and peanut patties, but my sights were set on a product I hadnâ€™t consumed in a while. I had never heard of Dickies candy, nor of their parent company Tyler Candy Co. (or even Tyler, TX for that matter), but I was drawn to their Pecan Roll – even if it was because of their mascot of an elephant draped with the flag of Texas… possibly the official candy of the Texan republican party? I had never eaten a pecan roll, but it seemed similar to those Yule Logs I find around Christmas, just this time covered in pecans instead of walnuts and minus the candied fruit. 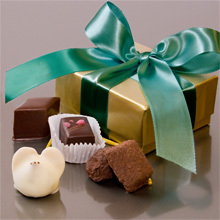 I meant to have a box of this for Valentine’s and write a review of it. It didn’t happen, and this box didn’t mean to happen either. I was actually buying them for Mother’s Day. I clicked on the wrong address in my account, and some stranger at my mom’s old address got a box of chocolate. They’re too fragile to be resold after they’ve been shipped back and forth, so all I could do was reorder another box. That was when things took a turn for the better. When I reordered, they somehow managed to send the order to me instead. Since it was their mistake, they sent another to my mom, and I got this one for myself. Obviously, we were meant to be together. There are two main things to know about this brand: First of all, this is very much a dark chocolate experience. 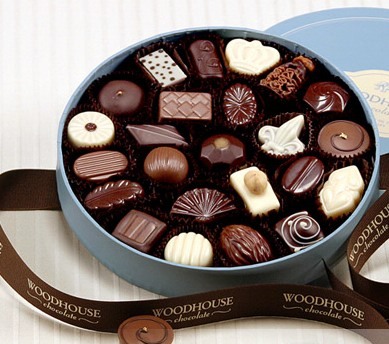 There are a few milk chocolate pieces, but if that’s what you prefer, go elsewhere. On the other hand, if you’re a dark chocolate fiend, like I am, read on. I am a native So Cal boy. As such, Seeâ€™s Candy was a staple of my youth, along with In-N-Out and Thriftyâ€™s Ice Cream. And itâ€™s true what they say: You never know how much you care about something until itâ€™s gone! Well, after moving to Austin, I now know. I recently got into graduate school and needed to fly to Los Angeles to tie up some loose ends. Yes, picking up my diploma (finally) and seeing the family were all very important things on my to-do list, but there was one that was above all the rest. 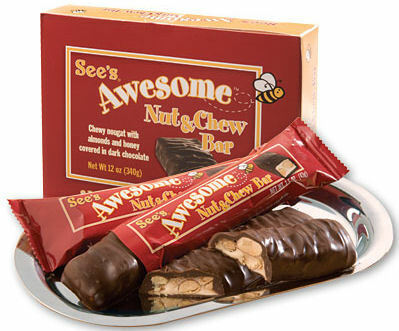 I remembered the Awesome Nut & Chew Bar from Steve Almondâ€™s latest additions to his Candyfreak candy list. He was in love. How could I not plan a trip to California just to try one?